It was the mistaken sinking of the Nazi Titanic – Cap Arcona. The British bombed the ship at the end of the war, killing thousands of Holocaust survivors. A group of advocates are working to finalize a nonprofit organization called Guam World War II Reparations Advocates Inc., which plans to sue the U.S. government in hopes that survivors finally receive compensation the group believes they deserve. The ceremony came more than seventy years after they helped America win World War 2. A review of documents released in the 1980s but unexamined until now shows the extent to which Jews were spying on Jews. The suspect is a 94-year-old former Nazi SS guard at the Auschwitz death camp. The book is largely focused on the Koch family, stretching back to its involvement in the far-right John Birch Society and the political and business activities of the father, Fred C. Koch, who found some of his earliest business success overseas in the years leading up to World War II. You should reveal your role in making history. 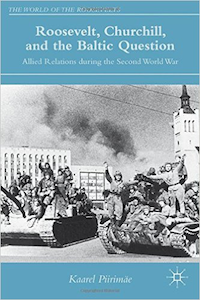 Review of Kaarel Piirimae's "Roosevelt, Churchill and the Baltic Question: Allied Relations during the Second World War"
Piirimae's book, is the first comprehensive study of the "Baltic Question" in Big Three diplomacy during WWII. The history’s more relevant than ever as Russia, China and Japan manipulate it for their ends. Ivan Maisky had a front-row seat at some of the most pivotal events of the interwar era, recording them in the only diary to have been written by a major Soviet official during Stalin’s great terror. The story of the last American killed in combat in World War II – and how his death almost changed the course of history. Unlike Germany, Japan never faced up to its wartime crimes. School children barely know what happened. A moving story about a historian’s investigation of his grandfather’s war story. The United States was complicit in legalizing the largest episode of ethnic cleansing that occurred in the twentieth century when 12,000,000 to 16,000,000 Germans came to be expelled from their historic homelands. There’s not even a visitor’s center.